An adventure fantasy set in a mythical, pre-historic age, Conan packs brutal danger and excitement with hair-raising escapes, savage tribal warfare, the wildest eduction scenes imaginable and countless other menaces and marvels hitherto undreamed. The story follows one man's quest to learn the 'riddle of steel" and thereby exact revenge on those who had so brutally murdered his parents. His target, the evil Thulsa Doom [James Earl Jones], head of a malign and powerful snake cult. His companions - Subotai the Mongol [Gerry Lopez] and the beautiful Queen of Thieves [Sandahl Bergman] who attempts to steal his heart. Muscleman Arnold Schwarzenegger plays Conan in this spectacular cinematic treatment of Marvel Comics' The Savage Sword of Conan', from supreme master of the bizarre and mysterious-director John [Apocalypse Now] Milius. The second retail release re-issue from 1989. 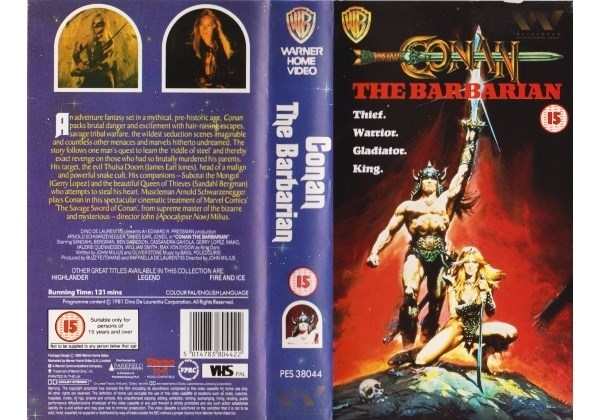 Or find "Conan The Barbarian" on VHS and DVD / BluRay at Amazon.